“Down with this underdeveloped Brazil.” That is how jeans-wear Ellus decided to engage with the World Cup — by putting that message in a shirt. I suppose they have a lame PR response, saying it is against the bottlenecks, not against the country. Still all Brazilians who understand our stray dog syndrome know what people who wear that shirt actually mean. After all, Ellus stores are attended mostly by folks who don’t use the public healthcare system. They don’t study at state schools. 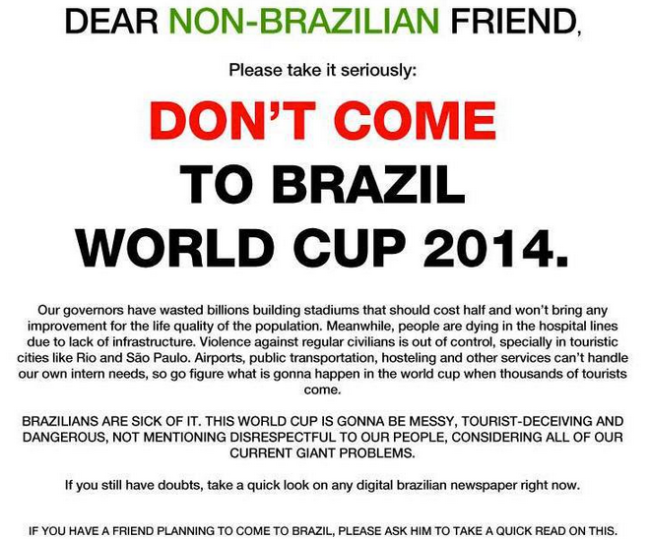 And they rarely set foot into public transportation in Brazil’s main cities (although they gladly do it abroad). So what are they frustrated about? Are they as selfless as the activists who protest with an end in sight, whatever that end is? Or do wealthy Brazilians voice their criticism out of sheer boredom? 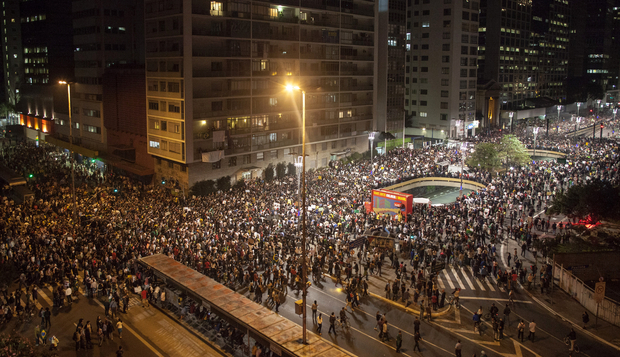 What are the protests in Brazil about? While Brazil’s economic well being looks promising in the short and in the medium run, things have been strange in the political arena. 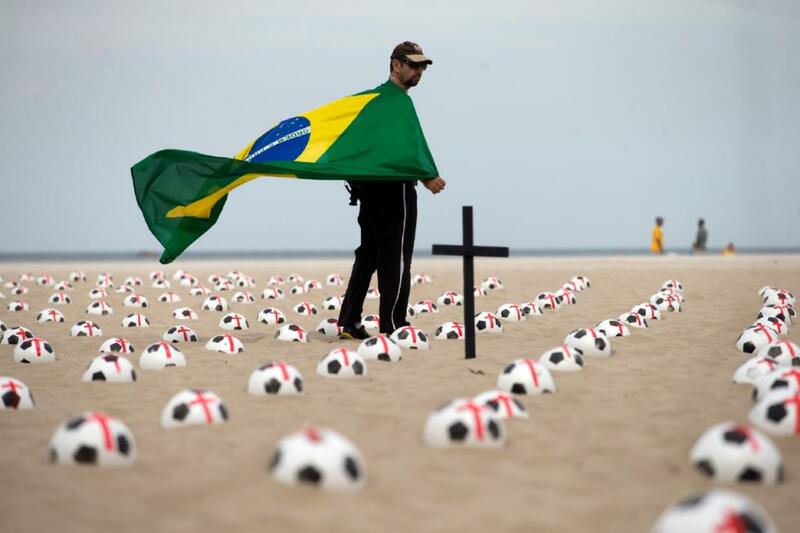 Earlier this year, during the Confederations football Cup, there was a raging wave of protests while, under the surface, there is political unrest that may erupt during the World Cup. Any uninformed person would jump to the conclusion that the protests come from the hungry masses who are discontent with the government for privileging big contracts instead of spending money on hospitals, education, housing etc… It is true that many are not happy but no, this is not where the anger is coming from. The discontent is coming from the middle and upper middle classes. The typical protester is a young, white male with a good level of education and no economic upheaval to deal with. In other words, the protests are coming from the right rather than from the left. In general, the vast majority of the Brazilians, the working class, do not have strong reasons to protest, a proof of this is that there are very few working class people in the protests. The statistics show that there has been an improvement in their standards of living; more jobs, more education, more consumption… the list is long. They have benefited from the policies of the current left wing party, the PT, that has been in power for around a decade and that will most probably win the next elections. So what are the protests about? Ask the average middle class Brazilian, and he will answer that they are about corruption in the government, more specifically among members of the PT. This is where the argumentation gets bizarre, they do not mention corruption in other parties, which in many cases is more severe than in the PT and if you listen closely, they will describe corruption as an exclusivity of the Lula and the Dilma governments, a clear fallacy for anyone who knows anything about Brazil. There will also be the technocrats who will say that they are annoyed at the enormous presence of the State in the economy. They will defend Brazil adopting an economic model closer to the precepts of Wall Street and of the City of London: leave everything to private enterprise; they have the most qualified people and they know what they are doing. However, this is not what the protest are about, the young people in the streets do not carry neo-conservative nor monetarists flags. These arguments are only being heard now when the economy is beginning to dip. It was not so when Brazil paid their gigantic external debt, fixed the hyperinflation that corroded Brazil in the 80’s and in the 90’s and when it became the darling of international investors. In fact, the last time anyone heard these voices was when they gave terrible advice to the military regime in tackling the economic crisis. Everyone knows that if it were for these people Brazil would never have climbed out of that hole. The question still begs an answer, what are the protests about? It is our understanding that they are about anxiety and powerlessness in the middle classes. The moralistic crusade, the hatred towards the left, the privileging of the technical over the democratic process reverts us to the rise of fascism and Nazism in the 1930’s. The country that the PT constructed during its large mandate has helped the rich to get richer and has taken a huge portion of Brazilians out of poverty. Meanwhile, the PT’s traditional voting base, the urban middle class, has not received the benefits of the economic growth. In many ways, they feel betrayed and are now worried about what will happen after the World Cup and the Olympic Games. Justified or not, the poison is in the air. 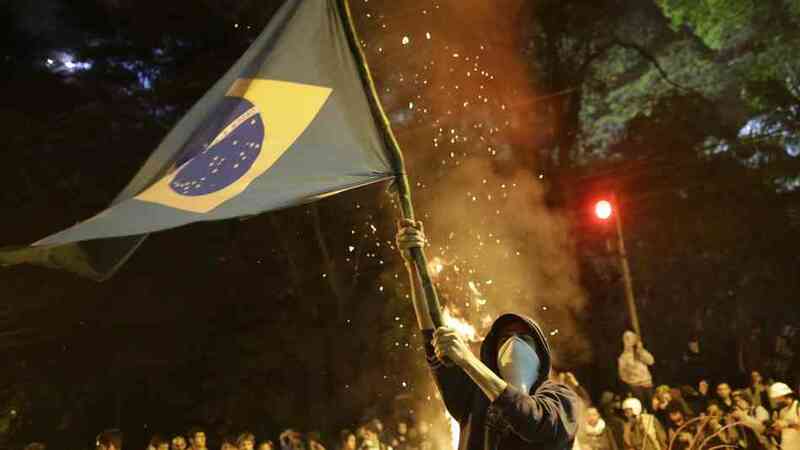 The protests were violent and there may be an escalation during the World Cup, when the embarrassment for the Government and the international exposure will be at its greatest. There are many questions: No one knows what this new right wants, not even themselves. All we know is that there is a lot of irrational anger and that they want the PT out. Apart from this, there is no party behind them nor do they have any leadership or any defined goal. Never the less problems may arise when some better organized group or power will appropriate this energy and use it for nonconstructive purposes. 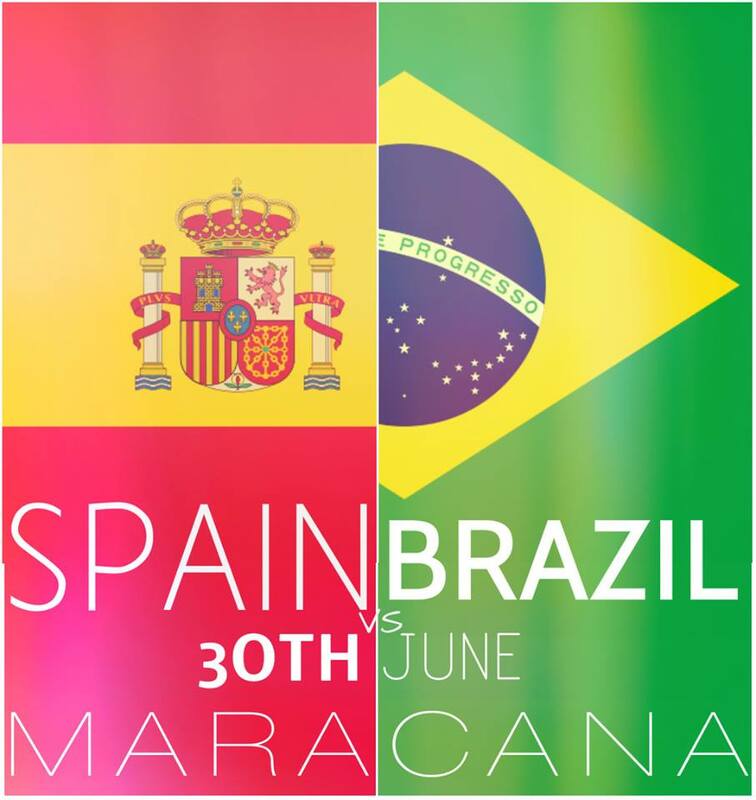 Brazil vs Spain: a football showdown. Tomorrow’s game is an important showdown for many football lovers. For some if Spain beats Brazil in the epicenter of Brazilian football passion, the Maracana, it be like the passing of the crown of world football dominance from Brazil to Spain. For others, if Brazil wins the match it will signify the coming of age of the Neymar generation where they will stop being a promise for the future and will become part of the Brazilian pantheon of football legends. For the coach Felipao, or Big Phill, who has been in charge of this Brazil team for a little more than a month this will not be the ultimate test. He is a pragmatic man who is still building the team, his aim is winning the World Cup next year, not the Confederations Cup. When he won the World Cup in 2002 with Ronaldo, Ronaldinho, Roberto Carlos, Rivaldo et Cie, his team had been appalling in the qualifying stages and he attracted a lot of enmity by not calling up Romario, the country’s top scorer at the time. Despite Big Phill’s pragmatism, the Brazilians will also want to win, loosing a final in Brazil’s major football temple in front of a gigantic crowd would be a disgrace they would not want to live with, neither the players nor the coach. With players who are still seeking international consecration there is the added stimulus of ranking upgrade. As for the game, Brazil and Spain have shown themselves similar in one aspect, they have “on” and “off” modes. When they are “off” they are vulnerable, nervous and make mistakes like any other team but when they are “on” they are unstoppable. The Spanish team has been playing together for longer and technically they are superior: more disciplined, more uniform in their talent and more seasoned in big competitions. But they have the disadvantage of coming from an exhausting game against Italy and many of the players will have the fear of facing the Brazilian yellow top in a competition. As for our predictions; we think that Brazil’s “on” mode is wilder, less predictable and more creative which allied with the unique atmosphere of the Maracana will give Brazil the advantage. Brazil will win.